At the Year in Infrastructure 2016 Conference, held in London earlier this month, both companies’ CEOs presented new construction workflows designed to increase efficiency and productivity with enhanced integration between their respective cloud services. This integration will include ProjectWise CONNECT Edition, Bentley’s cloud-based document and model sharing platform, MAGNET Enterprise, Topcon’s web-based field and office data management system, and ContextCapture, Bentley’s reality modeling software. Although ContextCapture previously only worked with photogrammetry, it can now incorporate point cloud data from laser scanners, facilitating the new workflow. Bentley Systems will be offering its ProjectWise CONNECT Edition users seamless connectivity with Topcon’sMAGNET Enterprise and Topcon will incorporate Bentley’s ContextCapture image processing for its mass data collection via unmanned aerial systems (UAS). Even with all the advancements in reality capture, building information modeling (BIM) and cloud storage and sharing, 3D data is often still recreated at different phases such as surveying, design and engineering, construction and lifecycle management, instead of being shared. The goal behind this partnership is to allow for a quicker and more accurate workflow than traditional methods. 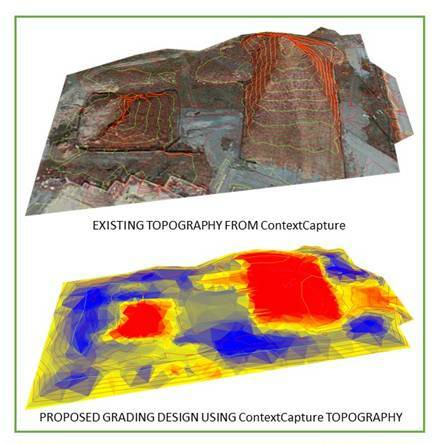 It provides engineers with an accurate 3D model of the current construction site conditions using Topcon’s photogrammetry and laser scanning technology. From there, that data is processed into engineering-ready 3D reality meshes by ContextCapture. Finally, the cloud-based service allows the engineering data to work directly with the construction processes in the field, even to the point where the digital engineering models can feed the 3D machine control that guides the construction machinery. For more information, check out the Bentley Systems website.